Yes, you have 5 seconds or less when a web page opens to make a connection with someone visiting that page. People have to immediately see something they understand and that "something" had best be based on a top task the visitors want to complete. Quick top task completion gives visitors a good experience. That makes them more likely to return to the website again. Your brand reputation benefits. An immediate connection depends on the power of words that stand out on the page. That's true for desktop and laptop visitors. It is especially true of mobile visitors. Today we pay homage to 6 higher education websites that distinguish themselves by their ability to create an immediate connection with the impatient, task-oriented people who use higher education websites. These "immediate impact" examples are taken from the 2015 Link of the Week selections. 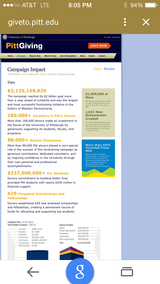 Most higher education home pages are dominated by a huge hero image, sometimes still part of a carousel series that few people stay on the page to see. Visitors have to search about the first screen or scroll down through layers of images and words to find the path to complete their top tasks. 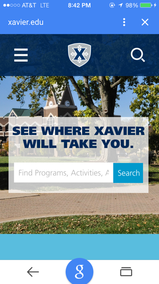 The home page design at Xavier stands out for the "can't miss" placement of the search box. Potential students are prompted to use search to "find programs" that interest them. Yes, there is a large image of a campus building. But nice as the building might be, it does not say anything distinctive about the school. Placing the search box right over that image says: "We want to help you find what you want to find." It creates a distinctive approach right from the start. 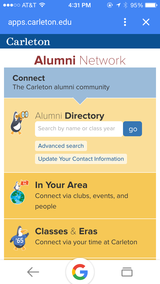 Here is an alumni page with a single primary purpose: make it as easy as possible for alumni to connect with one another. If you view this on a desktop or laptop you'll find a discrete right column link to "Make a Gift to Carlton" but making a gift is not a top task for most alumni visiting a website like this. Of course, if you are searching for a particular person you can try the directory at the start. 100% have no debt at graduation. 20% pay nothing at all to attend Harvard. Large-screen visitors will see the same 3 points horizontally across the top of the page. The Net Price Calculator is visible in the center of the page. The language used in the "How Aid Works" section is a remarkably jargon-free example of "Writing Right for the Web." Can I get a scholarship at your university? That or something similar is a question often heard by admissions counselors at college fairs. Most schools do not make the answer as easy to find as Eastern Kentucky does on their 4-part form for "First Time Freshman." 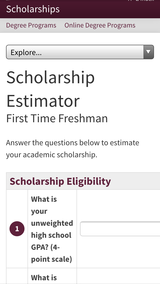 Your estimate is available immediately after you tell EKU your high school GPA, your ACT or SAT score, and your state of residence. Just below the estimated scholarship amount are links to apply for admission, make an inquiry, or schedule a campus visit. That's perfect path positioning for a potential student encouraged by the scholarship possibility to take the next step on their college selection journey. This page wastes no time letting visitors know how much money has been raised and the major ways in which that money will be used. How many people invested in the campaign. How many "alumni champions" participated. 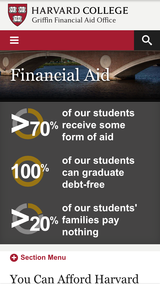 The amount dedicated to financial aid for students. The number of "Perpetual Scholarships and Fellowships" created. After people have scanned the top data points, they can remain to note the sizes of various donations and the sources of the money. Like the Xavier home page, this program entry page takes the unusual but strong step of placing key links right on top of the video that opens the page. The video is visible as background, but it does not push the important words further down on the page where they are not immediately visible. Where can I study it? When can I study it? The result? 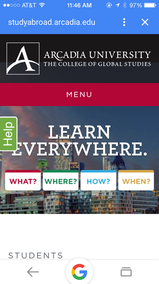 Another clean and simple page that takes people quickly to the content needed to complete their study abroad tasks. Subscribe to "Your Higher Education Marketing Newsletter" for monthly marketing news and notes and weekly Link of the Week selections. Join 7,050+ people and follow me on Twitter. Follow me on Twitter at twitter.com/HighEdMarketing for daily marketing updates. And now here are your December marketing news and notes. Social Media Strength: Top Media-Savvy Universities in the U.S. If you like infographics you will love this view of the top social universities in categories that include total online mentions, facilities, professional schools, Twitter mentions and followers, and Facebook likes. If you advertise online the strong trend to use ad-blocking software, especially among Millennials, raises new challenges to a decent ROI from your advertising dollars. Visitors to gaming sites are most likely to use ad blockers, at 26.5 percent. Visitors to education sites are at 16.9 percent adoption. Both charities and government sites are under 5 percent. Two goals are most important to the success of a content marketing strategy. First, reduce the content of your current website by at least 50 percent to improve search and navigation. Second, focus on making it as easy as possible for visitors to complete their top tasks. What quickly dooms content marketing? The wide-spread addiction to "ego content" that is difficult to escape. Think welcome messages from presidents and deans and "Disney World" photos and stories. Moody's is back with a November report based on a survey of 169 private sector universities and 129 public sector schools. The report: 50 percent in the private sector either expect falling tuition revenues or gains of less than 3 percent. Similar "softness" was reported in the public sector. Continuing price-sensitivity and fewer students in the Midwest and Northeast again were cited as the culprits, fueling increased tuition discounting to maintain enrollment levels. Sean Carton is a smart fellow. And he has just written a blog entry to help marketers navigate their way through the sometimes arcane world of digital marketing strategy, with a special focus on avoiding magical declarations from digital oracles masquerading as high priests. Study and answer the 9 questions from Sean "when developing a digital strategy" to keep your plans as realistic as possible. My favorites were Question 4 (What resources do we have available?) and Question 7 (If we do this, what are we going to do less of?) because both force the strategy discussion down to the real world. At most college and university websites, finding the Net Price Calculator from the home page is still rare even though cost information is a top task for many if not most potential students. Carroll University joins a tiny group of four schools I have found so far, with versions for both freshmen and transfers. Hiram College athletic teams are known as the Terriers. And starting in 2016 up to 5 new freshman students can receive a one-time $1,000 scholarship based on how well they show a love for terriers. Did people like this really exist in the 1980s? It, for sure, was not a time of reality marketing.